A nimble hand leads the venerable Settlement Music School. The concert was the culmination of the Music Education Pathways program (MEP), a year-long collaboration between the Philadelphia School District and Settlement Music School. In it, students receive intensive after-school music instruction from Settlement faculty, as well as whatever instruction their own schools can provide. Needless to say, the parents were thrilled, both with the quality of the instruction and the effect on their children of performing with the orchestra and choir. Equally pleased was Helen Eaton C’93, Settlement’s CEO, who started the MEP program four years ago. Founded in 1908, Settlement is one of the largest community schools for the arts in the United States. The 200 members of its faculty and staff teach and provide activities to some 5,000 students at its six branches in Philadelphia and South Jersey. Prominent Settlement alumni include Questlove, Kevin Bacon, Stanley Clarke, Chubby Checker, and an adult student named Albert Einstein, who traveled from Princeton on weekends to play chamber music. Since taking the reins in 2010, Eaton has expanded community engagement with student programs and performances at social service agencies, homeless shelters, parks, libraries, and retirement communities. She also brought the Kardon Institute for Arts Therapy under Settlement’s wing in 2014 to serve students with special needs. It’s now the largest provider of arts therapy in the region. Eaton originally thought she would pursue a career as a musician. After becoming first-chair viola in the Penn Symphony, she went on to study the instrument at Juilliard. Several experiences, including teaching English to foreign students at Juilliard, led her to become a teacher and administrator. She served as president of the Chicago Children’s Choir from 2007 to 2010, and as dean of programs at the Merit School of Music. She has been devoted to increasing children’s access to music. Jeffrey Kallberg, the William R. Kenan Jr. 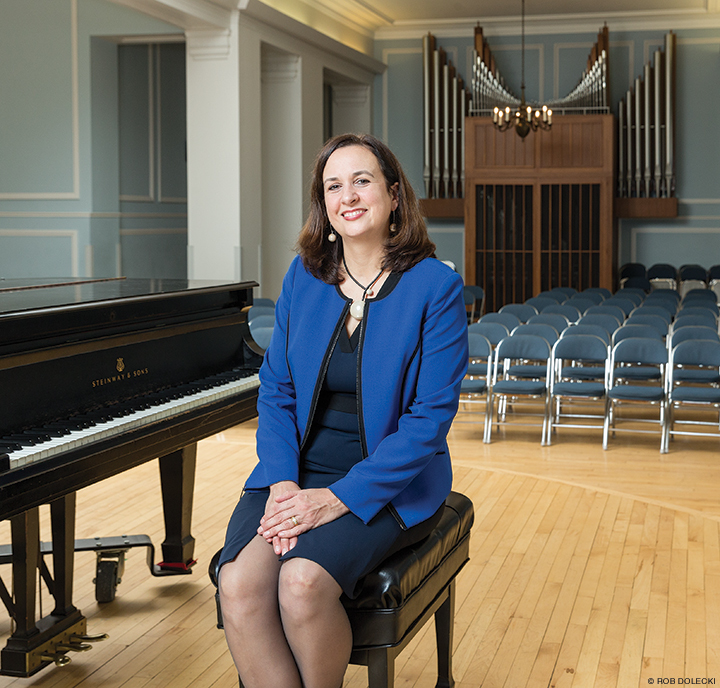 Professor of Music and associate dean for arts and letters at Penn, joined Settlement’s central board of trustees two years ago. It’s fair to say that he’s a fan. Eaton sees the fundraising part of her job as an “opportunity to connect with people and to provide opportunity for donors to connect with institutions I really care about.” She recently helped Settlement receive significant grants from the Andrew W. Mellon Foundation and the Pew Charitable Trusts. The Mellon Foundation’s $2.5 million gift to Settlement and other city organizations, including the School District of Philadelphia and the Philadelphia Orchestra, helped increase diversity in the classical music field by supporting a cohort of 75 students chosen from throughout the region. The Pew grant for $500,000 will be used to develop new methods to engage with 21st-century music students.